Recently, tick bites on humans in the United States led to a rise in cases of Lyme disease. This led the Infectious Disease Society of America (IDSA) to update their guidelines for assessment, prevention and treatment for Lyme disease. These guidelines are present on the CDC website. Here, we are summarizing some of these guidelines with focus on what works and doesn’t work in case of tick bites on humans. What to do if you have a case of Tick bite on a loved one? Attached tick could be the black legged Deer tick called Ixodes Scapularis. These are common in Eastern parts of USA including New Hampshire and New Jersey. Images of these parasites are readily available online. If you have a sample of the tick that you have caught on yourself or your family member, you can ship it to the local health center for identification by an entomologist. The tick has to be attached for more than 24 hours. Prophylaxis may be started on within 72 hours. Prophylaxis drugs are antibiotics that help prevent infections following microbial activity. A vaccine for Lyme disease prevention is available in many parts of the country. It is recommended for people who spend a lot of time outdoors in high risk areas known for Ticks and Lyme disease. Talk to your doctor if this is suitable for you. Avoid grassy trails. Walk on well-used and clear paths. Wear full protective clothing. If needed, invest in clothes made specifically for hiking and repelling ticks and other parasites. These are permethrin treated clothes that are readily available online. Note that their effectiveness reduces after a few washes. Spray yourself with DEET like insect repellents. Wear long sleeved shirts or full pants that are light colored so they help you sight ticks before they latch on to your skin. Cover your head with scarf or hat. Make sure your neck is protected too. Tuck pants inside shoes and socks. Spray the repellent on your camping and hiking gear including your shoes. Inspect the member of your entourage after you come back from your hike. Check all the clothes, gear and scalp as ticks can hide in the hair. If needed, shower immediately after you are back. If you have pets that spend a lot of time outdoors, inspect them carefully using tick combs. If despite these precautions you have a case of tick bites on humans, see the doctor immediately or at least if you notice symptoms like fever, muscle aches, general malaise or lethargy, rash, difficulty in swallowing, swollen lymph glands etc. What does not work on ticks? 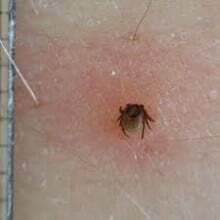 People often use strange methods of removing ticks including applying gasoline, Vaseline or petroleum jelly, burning the tick using a Cigarette or flame from a lighter/matchstick, dousing it with rubbing alcohol etc. Not only do these things not work, they are very dangerous and can also increase your chances of getting infected, or worse, injured. When should you remove the tick by yourself? Only remove the tick yourself if it is not burrowed too deep. You can even get a friend of family member to help you. Avoid using your fingers or nails to remove the engorged tick as this could cause you to pull it out incompletely which can still lead to infections. Worse still-the tick could get squished spilling blood out which can infect you through cuts in the skin. Always use a pair of tweezers or a tissue paper wrapped around your fingers when pulling the tick out. Gently but firmly grasp the tick’s body very close to where it is inserted its mouthparts into the skin. Firmly pull the tick out so it remains intact. Some part of the skin or body hair may remain attached to the tick’s mouth. This is completely natural. Discard the tick by flushing it or, alternatively bag it for identification. When should you have a medical professional pull the tick out? If the tick is under the skin or has been attached to your skin for more than 2-3 days, then it may get very difficult to remove it completely. In such a case, it is best to see the doctor or a registered health care professional who can remove the tick without leaving its mouth parts in the skin. Tick bites on humans can lead to many diseases. So prevention and aforementioned precautions are essential to be followed. Tick Bites vs Spider Bites - What is the Difference?